Consonant please, Gandalf… I mean Carol… What on Earth is happening here? For the uninitiated, Spell Smashers could easily be seen as just another throwaway fantasy deck-building game. Look closer, however, and you’ll discover that Spell Smashers offers something altogether more cerebral. A cross between Scrabble and a lightweight role-playing game set in a fantasy universe, Spell Smashers is a fairly unique concept that somehow works without becoming as convoluted as it sounds like it might. 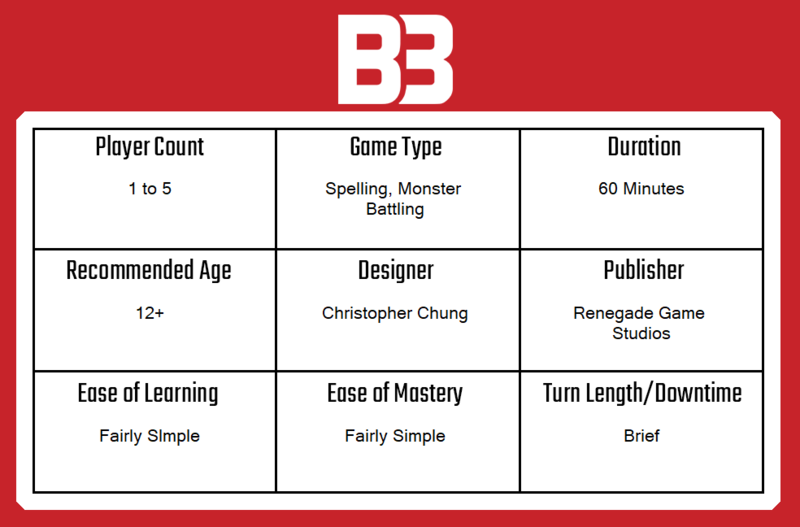 As a somewhat understated and overlooked gem, let me convince you why Renegade Game Studio’s latest effort might be worth adding to your collection. 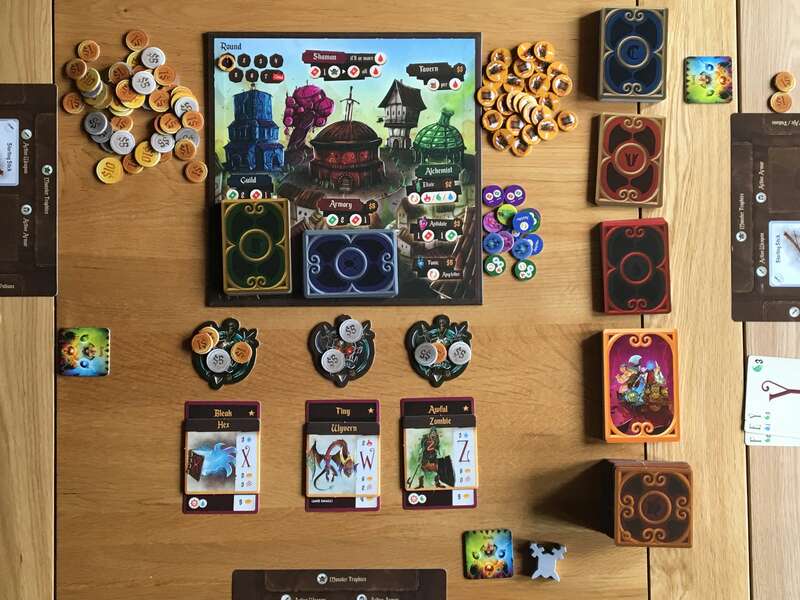 The basic premise of Spell Smashers is very simple, but like all the best games, layers of nuanced complexity add more and more to the gameplay as players dive deeper into it. At its most simple, the players take turns to deal damage to the somewhat randomised monsters by playing cards that spell words of different values. This works just like Scrabble in practice, with common letters worth just one point of damage and more hard-to-place ones (like Y or Z) dealing more pain. 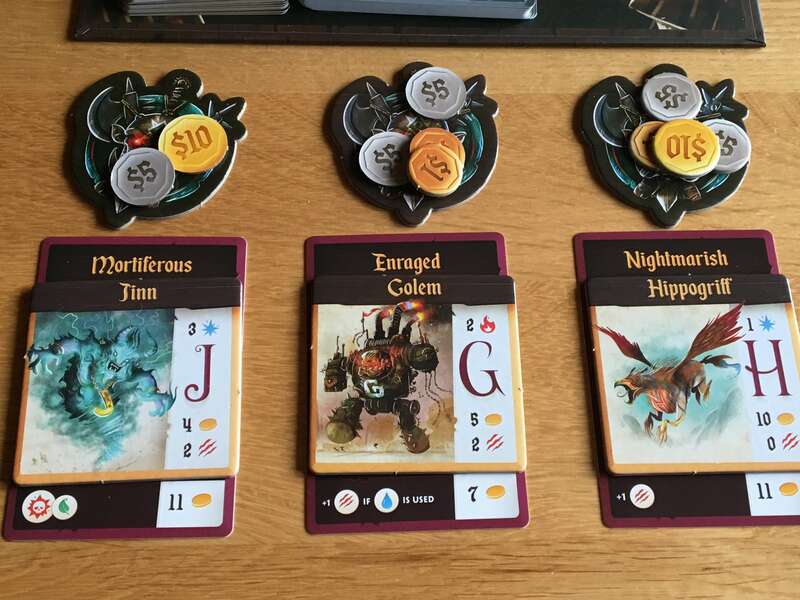 There are two reasons for attacking these enemies: firstly to claim coins from the monster card (up to the value of the damage dealt) and ultimately to defeat the monster and claim it for points at the end of the game. There’s a bit of strategy here, because players who act first can potentially defeat a monster in one hit, claiming both the coins and the points, but more often than not (especially early in the game) players lack the punching power to take out an enemy completely, which will often leave it vulnerable to being defeated by a second attacker. Monsters are not defenseless, however, and most deal wounds that add cards to the hand of the player who attacks them. Wounds are interesting, because they are themselves usually combinations of two letters that clog up a hand until they are used. When you place them, however, they tend to result in a powerful counter punch that brings what feels like a worthwhile reward for working them into an otherwise mundane word. If you think that’s all, though, you’re mistaken. Why would you need coins? Well, to buy items, potions and armour, of course. All of these things layer in additional rules and benefits that can help in later rounds — weapons might enhance the power of your attack considerably under certain circumstances for example, whilst armour might prevent wounds or allow an immediate counterattack. The potions allow various repeatable, rule-breaking tweaks whereby players can discard cards or twist the elemental damage a specific letter does. On that note, there is still more to discuss. Each letter comes with an elemental damage type that can make the word you spell either more or less effective, or change how much it is impacted by different items. There are even quest cards to draw and fulfill, which could mean that player will score points for achieving feats that are a layer below the basic standing order to defeat monsters. You can even earn points by visiting the tavern and showing off your wounds in return for ale, which is a fantastic balancing mechanism for those turns when wounds legitimately do prevent players from acting as they would like to. With all this to contend with, Spell Smashers has the potential to overwhelm, but somehow, it just doesn’t. I think it’s perhaps because the core mechanic of spelling words to defeat enemies is so powerfully simple that it stands clear above any noise that the other elements of gameplay might introduce. 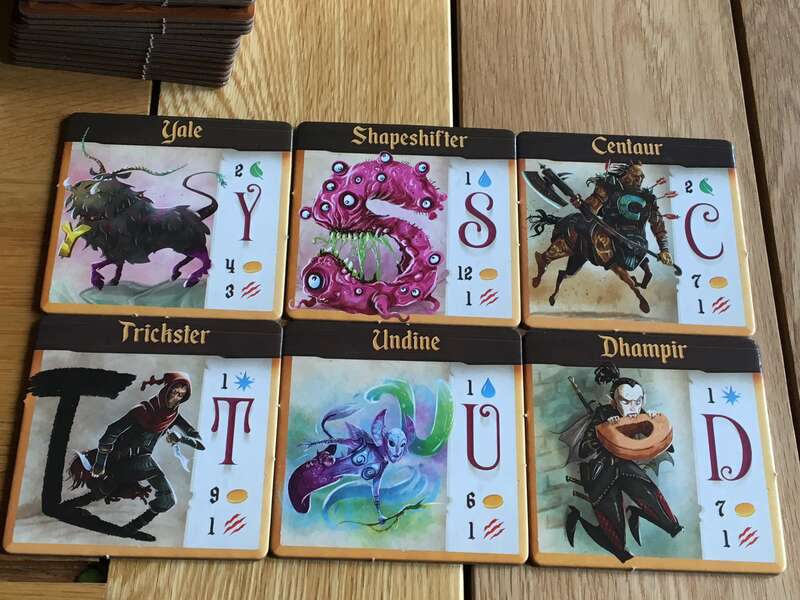 The basic gameplay in Spell Smashers feels classic and immediately familiar, but I also love how the more modern elements of balancing, randomisation and ways to reduce a reliance on luck are introduced via the cards, tokens and ancillary elements. If there is a downside, it’s probably the setup, which can be a little convoluted simply because of the number of decks, components and other pieces that need to be sorted through. I found that bagging each deck of cards separately after packing up each game helped a lot, because whilst card backs are clearly distinguishable, consonants, vowels and wounds will be intermingled by the end of the game. Objective, item and other cards are less likely to end up out of position, but again, by separating them, you’ll speed up setup a fair bit. 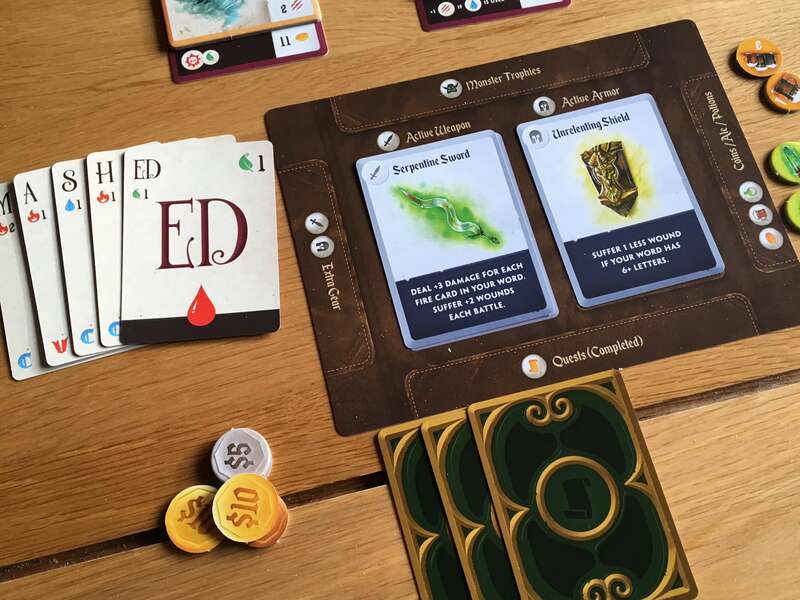 Tokens, on the other hand, can be split into three piles — cash, ale, then all forms of potion in a single bag (or pile). This is because coins will be used constantly throughout the game and in all denominations, whilst ale serves a distinct function that is likely to be needed by all players at some point during the game. Potions, on the other hand, are used fairly sparingly and when you decide which one you need in a specific circumstance, searching through a relatively small pile isn’t such a chore. The monster-randomisation elements are quite interesting in Spell Smashers and I think they form one of the most compelling differences from one game to the next. In a nutshell, players draw monster and trait cards blindly from a pair of decks, then place the monster card on top of the trait card so both can be seen. The combined value of coins on both cards acts as the monster’s health and value, but it also creates an amusing name such as ‘Nightmarish Hippogriff’ as seen in the picture above. This feature brings both a random element (which can result in some tough adversaries) as well as a welcome bit of character. Although it’s early days yet, Spell Smashers is one of the most refreshing games I’ve played in 2019 so far, or even longer when I think back to the latter half of 2018. There is a classic Scrabble vibe to the central mechanic, but that only serves to introduce new players to the basic concepts. Beyond that, there’s so much more to explore here from one game to the next that Spell Smashers is very capable of surprising even after two or three consecutive games. On that note, it is also brief enough that it never really outstays its welcome, with just seven rounds (and about an hour or so) per game. The good-looking components, excellent gameplay and high replay value make me want to recommend Spell Smashers quite highly. It manages to be simple yet rewarding to play and whilst Spell Smashers does draw upon the classic word game I’ve mentioned twenty times already, it also brings a lot of its own ideas which make it feel unique to play. Overall, Spell Smashers is a game that I really do enjoy and will look forward to playing again in the future.